There are plenty of reasons to celebrate summer, but unfortunately it’s also the season when funguses threaten our lawns. Two of the most common, brown patch and dollar spot, spread quickly and can cause significant damage. (Zoysia patch is also prevalent in our area, but since it only affects Zoysia lawns, that’s a subject for another day.) Treating these conditions once they’re established can often be difficult. Prevention can keep your lawn disease-free, even during our hot and humid summers, while saving you time and money. The indicators of fungal infections vary from dead spots to slimes and molds, so it’s important to be familiar with the symptoms you’re most likely to encounter. Identification: This disease is named for the asymmetrical shaped brown areas that it creates, ranging in size from a few inches to a few feet. Left untreated, the center of a patch may recover. The resulting patch will resemble a donut or wheel, with a healthy green center. Causes: The Rhizoctonia fungus, which rots the roots and stems of plants, loves our hot and humid Southern summers. A common error, watering often but not deeply, encourages its spread: It thrives when the surface of the grass is wet but the underlying soil remains dry. Prevention: Deep and thorough watering can help slow the spread of brown patch. The best time to water is early in the morning to cut down on evaporation. But your toughest ally is plentiful and requires little effort on your part: sunlight. Reducing the size of shaded areas around your lawn will make it harder for brown patch to take hold. Treatment: Since not much can be done about rainfall or humidity, fungicides are often your best option. Contact us to discuss your treatment options. Identification: This quick-spreading fungus gets its name from the spots it causes, which are initially about the size of a silver dollar. 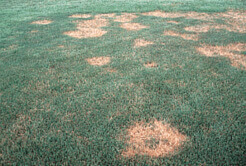 However, the straw-colored patches can get much larger if left untreated. Causes: A fungal pathogen called Sclerotinia homoeocarpa is responsible for this condition. Conditions that encourage its spread include low-moisture turf and fertilizer that lacks sufficient nitrogen. Prevention: The critical step in reducing the threat of this disease is figuring out the level of nitrogen that’s right for your turf. If this isn’t one of your areas of expertise, professionals will know what kind of fertilizer is best for your grass type. Watering deeply and infrequently will help keep soil moist. Treatment: The right fertilizer regimen will often clean up dollar spot, but serious cases will require the application of a fungicide. If you suspect this fungus is threatening your yard, we have a treatment program that can help. We’re proud to be your partner in keeping your lawn looking its best. Our treatments work best when combined with a robust maintenance routine. Proper mowing, aeration, watering, and fertilization will go a long way toward safeguarding your turf from funguses and a wide variety of other problems. That said, it’s important to keep your eyes open for signs of infection — early detection is a big advantage in the battle to keep your lawn healthy. If you notice signs of fungus or anything that concerns you in your lawn, give us a call. We’ll evaluate the problem and recommend the right treatment. Together, we’ll keep your lawn disease-free and beautiful.